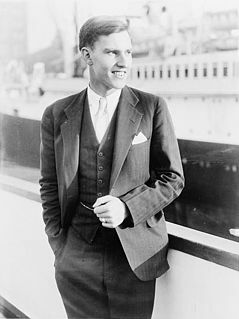 Finn Ronne (20 December 1899 – 12 January 1980) was a Norwegian-born U.S. citizen and Antarctic explorer. Finn Ronne was born in Horten, in Vestfold county, Norway. His father, Martin Rønne (1861–1932), was a polar explorer and served in Roald Amundsen's successful expedition to the South Pole. Ronne received his education in engineering at Horten Technical College. In 1923 Finn Ronne immigrated to the U.S. and gained citizenship in 1929. After working at Westinghouse Electric Corporation for some years, he took part in two of Richard E. Byrd's expeditions to the South Pole, and in 1939 Ronne served as Byrd's executive officer helping discover one thousand miles of new coastline. After serving several years in the United States Navy, gaining the rank of Captain, Ronne returned to Antarctica in the 1940s, with support of the American Geographical Society. The Ronne Antarctic Research Expedition from 1946 to 1948 mapped and explored the Weddell Sea coastline and set a number of polar records. Ronne covered 3,600 miles by ski and dog sled—more than any other explorer in history. His wife Edith Ronne accompanied him on this expedition, serving as ‘historian and correspondent for the North American Newspaper Alliance’. She and the chief pilot's wife Jennie Darlington were the first women to overwinter in Antarctica. In the 1950s, the Navy organized Operation Deepfreeze to complete the mapping of Antarctica and establish centers for scientific research. Ronne became the scientific and military leader for a U.S. Weddell Sea base. During his lifetime he wrote several books on Antarctica and many scientific papers on Antarctic research. He received three medals and numerous military awards for service, for geographical exploration and for the advancement of science. He was awarded the St. Olav's Medal by the King of Norway. At his death in 1980, in Bethesda, Maryland, Ronne was buried in Section 2 of Arlington National Cemetery. 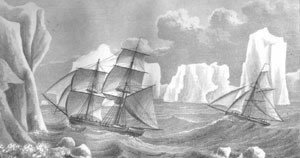 The Finn Ronne Memorial Award is awarded by The Explorers Club to an individual noted for accomplishments in polar field research that best typify the spirit of Explorer Finn Ronne. "Biography of Finn Ronne". Retrieved January 31, 2013. The history of Antarctica emerges from early Western theories of a vast continent, known as Terra Australis, believed to exist in the far south of the globe. The term Antarctic, referring to the opposite of the Arctic Circle, was coined by Marinus of Tyre in the 2nd century AD. Rear Admiral Richard Evelyn Byrd Jr. was an American naval officer and explorer. He was a recipient of the Medal of Honor, the highest honor for valor given by the United States, and was a pioneering American aviator, polar explorer, and organizer of polar logistics. Aircraft flights in which he served as a navigator and expedition leader crossed the Atlantic Ocean, a segment of the Arctic Ocean, and a segment of the Antarctic Plateau. Byrd claimed that his expeditions had been the first to reach both the North Pole and the South Pole by air. However, his claim to have reached the North Pole is disputed. Jackie Ronne was an American explorer of Antarctica and the first woman in the world to be a working member of an Antarctic expedition (1947-8). She is also the namesake of the Ronne Ice Shelf. Wilhelm Filchner was a German explorer. He travelled in the Pamir ranges, Tibet and the Antarctic. The Filchner-Ronne Ice Shelf in the Antarctic is named after him. Paul Allman Siple was an American Antarctic explorer and geographer who took part in six Antarctic expeditions, including the two Byrd expeditions of 1928–1930 and 1933–1935, representing the Boy Scouts of America as an Eagle Scout. In addition to being an Eagle Scout, Siple was also a Sea Scout. His first and third books covered these adventures. With Charles F. Passel he developed the wind chill factor, and Siple coined the term. Operation Highjump, officially titled The United States Navy Antarctic Developments Program, 1946–1947, was a United States Navy operation organized by Rear Admiral Richard E. Byrd, Jr., USN (Ret), Officer in Charge, Task Force 68, and led by Rear Admiral Richard H. Cruzen, USN, Commanding Officer, Task Force 68. Operation Highjump commenced 26 August 1946 and ended in late February 1947. Task Force 68 included 4,700 men, 13 ships, and 33 aircraft. Operation Highjump's primary mission was to establish the Antarctic research base Little America IV. This list of Antarctic expeditions is a chronological list of expeditions involving Antarctica. Although the existence of a southern continent had been hypothesized as early as the writings of Ptolemy in the 1st century AD, the South Pole was not reached until 1911. Antarctic Conquest: the Story of the Ronne Expedition 1946-1948 is a 1949 science book by Norwegian-American Antarctic explorer Finn Ronne and science fiction writer L. Sprague de Camp, published in hardcover by G. P. Putnam's Sons. The role of de Camp, who was commissioned as a ghost writer to recast Ronne's manuscript into publishable form, is uncredited. Ronne's working title was reportedly "Conquering the Antarctic". Isaac "Ike" Schlossbach was an American polar explorer, submariner and aviation pioneer. George John Dufek was an American naval officer, naval aviator, and polar expert. He served in World War II and the Korean War and in the 1940s and 1950s spent much of his career in the Antarctic, first with Admiral Byrd and later as supervisor of U.S. programs in the South Polar regions. Rear Admiral Dufek was the director of the Mariners' Museum in Newport News, Virginia after his retirement from the Navy in 1959. Ellsworth Scientific Station was a permanent, all year-round originally American, then Argentine Antarctic scientific research station named after American polar explorer Lincoln Ellsworth. It was located on Gould Bay, on the Filchner Ice Shelf. Gould Bay is a bay located at the junction of the Filchner Ice Shelf with the northeast corner of Berkner Island, in the southern Weddell Sea. It was discovered by the Ronne Antarctic Research Expedition, 1947–48, under the leadership of Commander Finn Ronne, U.S. Navy Reserve, who named this bay for Laurence M. Gould, geologist, geographer, and second in command of the Byrd Antarctic Expedition, 1928–30. Martin Richard Rønne was a Norwegian sail maker and polar explorer. Denis Joseph "Joe" Healy was an American explorer who was a member of the United States Antarctic Service Expedition. East Base on Stonington Island is the oldest American research station in Antarctica, having been commissioned by Franklin D. Roosevelt in 1939. The station was built as part of two US wintering expeditions – United States Antarctic Service Expedition (1939–1941) and Ronne Antarctic Research Expedition (1947–1948). The base covers 1,000 metres (3,300 ft) from north to south and 500 metres (1,600 ft) from east to west. The base was accorded the status of one of the Historic Sites and Monuments in Antarctica on 7 May 2004.